It started three days after the sidewalks of Anatevke were rolled up; a question popped up on the ECT Facebook page asking “OK if we are doing a play next year and not a musical what play are we doing?” Since then the suggestions have rolled in. I guess I live in an alternate plane from those on Facebook. I’m happy to be reacquainting myself with my home life and my pillow. (I’m really good at sleeping, in fact, it’s the one thing I excel at and these productions really cut into my practice time.) I have a canoe that is still resting in the rafters of my garage, hoping it will get to come down from its winter storage place and get wet. I have a couple of fly rods in the trunk of my car wanting to be released from their cases and waved in the air. I have house projects to catch up on. In short I want some time to go do the other fun things that summer is for. Also I have enjoyed listening to the people around town and out at the Piggly Wiggly tell me about how wonderful the play was. It was described as “professional” and “amazing” and “my, what talent there was”. “Why would you go to the Fireside [Dinner Theater] when you can see such great shows here?” It validates the work and effort that was put into the production. One thing that has amazed me during my involvement with ECT, is how quickly we hop from one production to the next, not taking much time to celebrate our achievements. We have strike and our cast party and go our separate ways. The Board will meet in August and the production team for A Christmas Story will get together in September and back into production we go. The other thing that amazes me is how much energy, effort, and work that goes into doing these shows. It chews people up and eventually spits them out. Sometimes you just need a break. 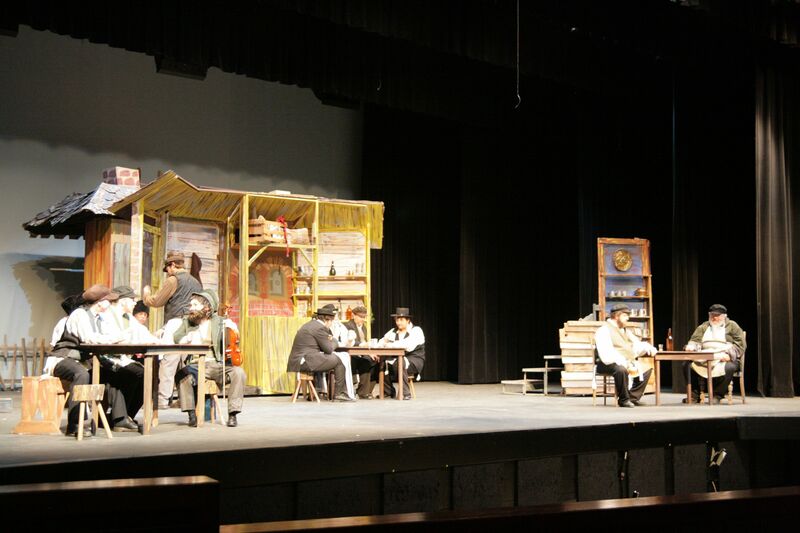 It is, however, refreshing to see that so many of those involved with Fiddler on the Roof enjoyed the experience so much that they are willing to go back at it already. Until then they have other choices, Stoughton Village Players will be holding auditions for Annie in August, and other possibilities can be found at Madstage , and, of course there is plenty of backstage help needed for our own production of A Christmas Story. So I looked up the word ephemeral–it’s one of those words that I hear from time to time but only have a vague idea of what it means. Simply it means fleeting or short lived. Tevye's house, Sunday morning before strike. Months of hard work, ideas, designing, rehearsing, singing, choreographing, reworking, building, crafting, sewing, memorizing, tuning, playing, arguing, laughing, teasing, crying, discussing, and finally executing it all. Six shows of actors giving every bit of their soul and the crew sweating every last detail. We had all anticipated those six shows. Finally the audience filled the Performing Arts Center, the pre-show announcement gets played, the stage manager asking the light board operator if the announcement is over–“I can’t hear it back here!” “When the backdrop turns red, open the curtain,” he replies. Six times that conversation happened. Six times the lights brought the backdrop to red and the curtain opened. Six times Tevye told us in one word why it was the way it was–Tradition! Six times the actors took the stage. Six times the villagers of Anatevka were evicted. And six times the audience was ours. The work in full swing. The production team had been meeting since February and then on Sunday morning, in three hours, Anatevka was no more. The walls came down, the props were sorted, the spike tape was pulled from the stage floor, the shop was re-organized and the sawdust was swept up, the costumes were hung and sorted to go back to from where they came and the microphones were cleaned and put away. Lane sorts and hangs the costumes. 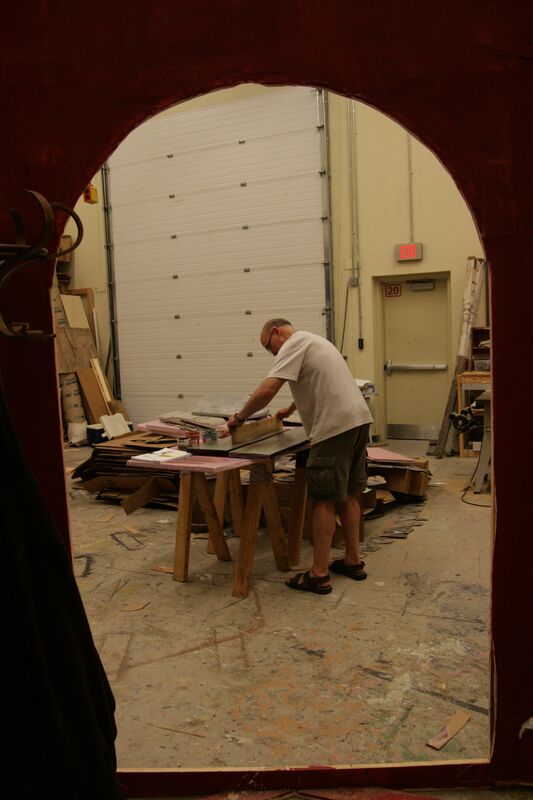 All of the disassembled pieces and parts of the set are stored in the high school shop waiting to become part of another play. They might reappear in the fall high school production, hidden under new paint. The ECT Facebook page was active as soon as the cast party was over. A happy and sad mix of missing each other and celebrating the accomplishment; withdrawal symptoms of this addiction. Now they will all try to resume their normal life–some sort of rehab might be required. All that remains of Tevye's house. But the next fix will come and when they all start working on their next play, the memories, both good and bad, will become part of the stories they will tell. That’s where Anatevka will live. Five and half months of work, hundreds upon hundreds of people hours and in just three short hours it’s all gone. That’s why I looked up the word ephemeral. Erin (right) and Colleen before the show. all TOGETHER. This cast and crew is a team. And not just any team. We are a FAMILY. We’ve shared each other’s joys and sorrows, happiness and anger. We’ve seen each other at our best and at our worst. We’ve spent long nights in each other’s company. We’ve worked so hard to get this show where we want it to be, and now all that work is going to pay off. And so here we are: OPENING NIGHT!!!!!! The reason we do what we do. Because there is no other feeling like the anticipation running up and down your whole being as you wait for that first moment in front of the audience. There is nothing quite like when you first step onto the stage and feel the lights hit you. When you know that everybody in the house is watching you and your cast members and there is somebody out there who came just to see YOU. There is no other feeling like when you are taking your bow and beaming because all that applause is for YOU. Or when the show is over and you can go meet your friends and family or even people you don’t know and they are telling you how great you were. Nothing else can give you the same high. Not a thing in this world can work the same magic that lifts you off the ground like the theatre can. The kind of high that keeps you soaring from the moment the anticipation of the show starts to long after the show is over. But you’re still flying and nothing can bring you down. Remember this as you go on tonight. Because that is why we are all here. To do our best, enjoy ourselves, and give the audience the time of their lives! So go out there, break a leg, and knock ‘em dead! During the Fiddler on the Roof Prologue, Tradition, there is a part that is particularly telling about how difficult it is to be an actor in a musical. It’s during the “horse,” “mule” argument when all 67 actors are on stage. They suddenly start at each other in what looks to be a chaotic clash then suddenly they reassemble into lines to finish the song. But the chaos is choreographed and each actor knows exactly where to go and where they need to end up. "The Sons" show their moves. I have been on stage a few times myself and when you discuss the experience with most people they reply, “I could never do that.” I could relate to that sentiment for a long time until one fateful evening I was talked into reading for Harvey and ended up being cast as the lead, Elwood P. Dowd. My strategy was simple, learn the lines, know the cues, and make sure your follow the blocking the director has set. It’s really a game of reliance, you listen to your fellow actors and say your lines when you’re supposed to. What I hadn’t realized is that sometimes, oftentimes, somebody drops a line–or jumps to a line that’s several pages ahead in the script. A good actor knows how to recover, tactfully reel it back to where it needs to be, maybe even bring it all back to the place where it all unravelled. Luckily, I was surrounded by good actors. And between the singing, dancing, and acting, could you mop the floor? Musicals bring in a whole lot more than just knowing your lines and blocking. You also have to know the words to the songs, the choreography, how many bars of introduction before you start singing. And sometimes you have scenes that have 67 people going every different direction around the stage. It truly is a demanding and challenging proposition. ECT, like many community theatre groups, strives to do great productions with limited resources. We are lucky to have experienced people that do a lot of our backstage work and cooperative relationships with other groups as resources for costumes and props, but when the curtain opens and the lights come up, it is all up to the actors. Their talent is what the audience comes to see. Now try doing this dance with a bottle balanced on your head. I’ve sat in my perch in the light booth, as I have done for our last three musical productions, and after watching the opening weekend of Fiddler, I can say that I can’t recall ever seeing a show that has gone as spot on as this one. The actors are truly enjoying themselves and letting their talent shine in every bit of the production. They truly bring out the emotions and depth that this show requires. If you haven’t seen it you should because this show truly illustrates what happens when a group of people dedicate themselves to something they love. Thanks to the talents of all involved, ECT has set a new standard for itself with a remarkable and amazing production. There’s a spot in the High School Performing Arts Center that is reserved after each performance. It’s the front row of the balcony. After the show the audience clears the PAC and the actors leave the stage and everyone congregates in the Commons. Family and friends bestow their accolades on the actors and everyone gets to bask in the afterglow of another show well done. Not everyone is in the Commons though. With a quiet and calm theater at their disposal, members of the tech crew congregate in the front row of the balcony, put their feet up on the rail and bask in the silence. I don’t know how that tradition started, but it has been one since we did the King and I in 2009. Paul, our Sound Designer for both King and last year’s production of Oklahoma probably sat down there because the row is directly behind the sound board. Melissa, the Stage Manager would appear from the backstage door and join him while Lyman and Hazel would materialize from their perch in the light booth at the top of the PAC. At this point after a performance, silence is golden. The group had been talking all during the show on headset—Melissa calling the show, Paul would voice his desperation when an actor had turned off a mic, a definite no-no, Lyman cueing the spot operators. There are several people on headset and so the backstage crew understands the stress that goes on throughout the theater during the show. The language gets rougher as the stress level goes up. The two people assigned to move a set piece have suddenly disappeared just as the scene change is supposed to take place, a premature blackout, plunging actors into darkness before their final line, and somebody hasn’t put their props back on the props table, a battery goes bad in a portable mic pack. A good night in tech means the audience didn’t notice. Community theater musicals are about bringing out the talents of the actors, their amazing ability to sing and dance and act. It’s not about a light show, or overpowering sound effects. Only the tech people in the audience notice, the rest of the audience is there to appreciate the show. I would guess that a good number of actors can’t tell you who did the lights or sound for their shows. But when the curtain call is over and the theater is empty, the tech team alights into the seats of the balcony’s first row and enjoys the silence, takes a deep breath, enjoys each other’s company and then, after a fifteen minute respite, they scatter to attend to the clean up and get ready for the next show. 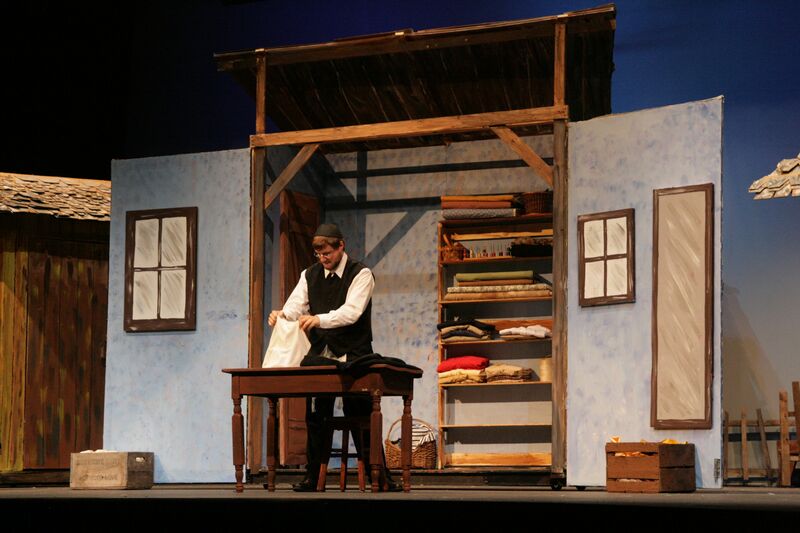 Fiddler on the Roof is a big show. Big in many ways and by now we all understand that very well. Our journey began in February, when much of the planning started. A thorough reading of the script revealed just how challenging the scenery alone would be, never mind lights, sound, costumes and, oh yeah, the actors with all that singing, dancing and, well, acting. From Tevye’s house to Morcha’s Inn, we’d have our work cut out for us building and painting the scenery. So, we put the call out early for help, hoping to inspire some ownership and build a bond (so to speak) between characters and set pieces. Yup, that’s right, these kids did most of the work. Pretty amazing! There is an old saying: it takes a village to raise a child. In our case, the children raised a village. Set Designer Scott, who’s been in at all hours doing the final adjustments, pointed out to the cast and crew that we have been working on this since February. But tonight is the night we have all been waiting for, the night where, when the curtain opens and the Fiddler starts playing, all we can do is hope the audience enjoys the countless hours of time given by everyone involved. At the sound board waiting for a microphone check. There will be bits of activity in the auditorium all day, Props Master Melissa will be reviewing and resetting the props tables in the wings. The maxim “a place for everything, and everything in its place” is her mantra and woe be to the person who doesn’t heed it. 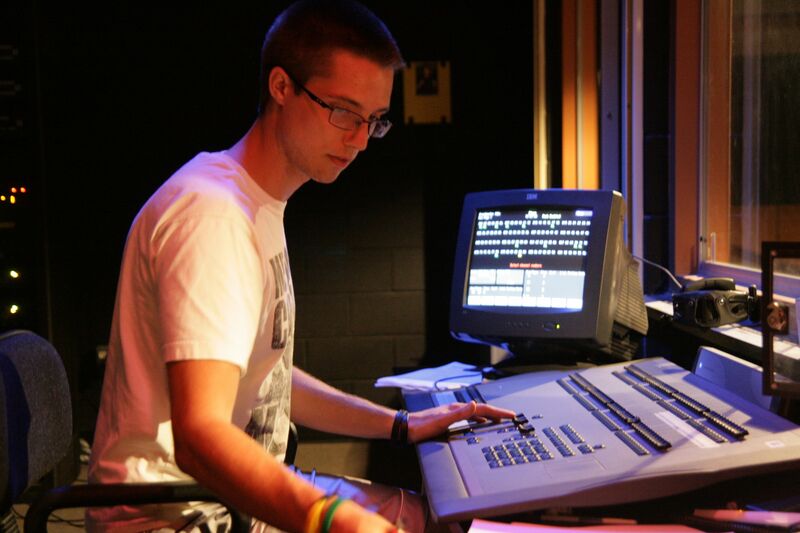 Lyman, the light board operator, has to make a couple of tweaks to the lights that were noticed last night–mostly adding some dim light behind the curtain at the beginning of act two so Tevye can get into position after his opening monologue. Then he will run through the cues one more time and follow along with the script to make sure that the lights come up or go down at the exact moment Alex,the Light Designer, had intended. Scott will touch up some frayed muslin, add a little more paint, and make other adjustments. Call, the time when everyone is supposed to be at the theater, is at 5. There will be mayhem in the green room as the actors, packed cheek to jowl in front of the mirrors, apply makeup. Liz, the makeup lead, and her team are responsible for some of the actors while others are responsible for their own. In the end Liz will give everyone a final inspection to make sure that the lights don’t wash their faces out. Alex uses a lot of ambers in his general wash light mix which softens the light and helps bring out the colors in the set pieces and costumes and casts a very natural look to the stage. It tends to wreak havoc on faces though and it becomes Liz’s responsibility to make sure they look right. After the make up is on, some actors will then mob the sound table to get their microphone packs. They will be strapped in various places on the actors so they are hidden from view. The wires from the transmitter packs will be snaked through the costume so they don’t interfere with the actors movements and then the microphone is wrapped over their ear and taped to their faces. 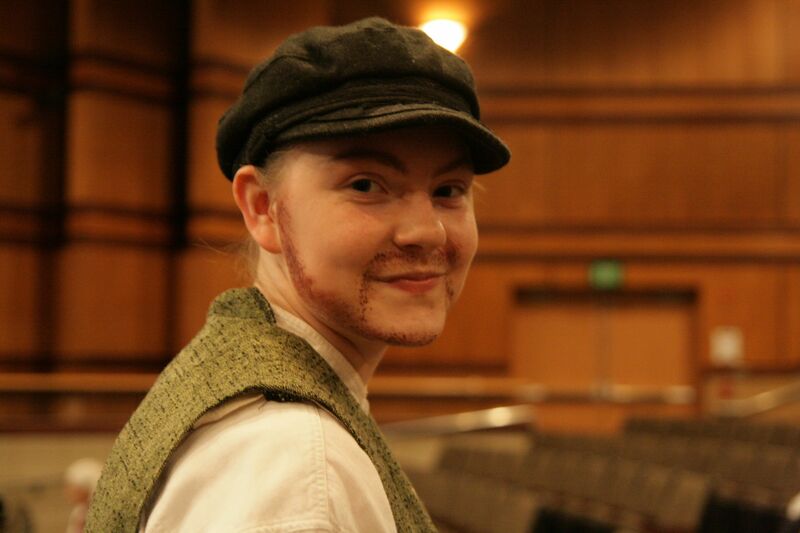 Many of the men have grown beards for this play and I can only imagine removing that tape at the end of each show. Then it is back to the green room for costumes. Lane and her team will assist and review everyone to make sure they are perfect before going out on stage. 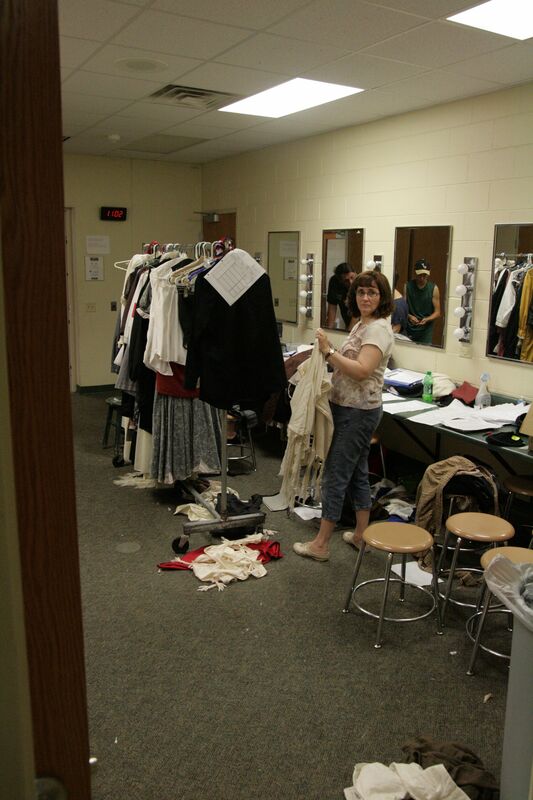 And her work doesn’t end when the curtain opens, there are costume changes throughout the show that will keep her busy. A crew of volunteers will sweep through the auditorium to make sure it is clean and at 6:30 the doors will open. The actors are sequestered to the green room or one of the rooms across the hall. The band will tune in the pit. The Stage Manager's call book. The band will play, the lights will come up, the Fiddler will start and Tevye will say his first line. Finally, we’re doing a show. It’s Friday afternoon, 45 minutes before rehearsal is supposed to start, exactly one week from opening night. Right now though, the stage is dark, the house lights are dim and the theater is empty and quiet with the exception of me, tapping out this post. The sound technician was here earlier on the phone with support from Telex, the makers of the wireless microphone system used during the show. It seems one of the receivers is detecting a lot of sound even though no microphone in the place is turned on. Sound Tech Clark heads to new heights. Upstairs the light tech was on the phone with Electronic Theatre Control’s support team. They walked him through reprogramming a control unit in the theater’s light system which had been acting up for the last two weeks. When they were done it appeared the system was back in order and ready for a show. The good karma does not extend to the sound tech. Unless there is a loose connection, and there isn’t, nothing else can be done. They don’t even make that model anymore. So sound will have one less mic to work with, it’s not the end of the world. With no luck on that front, he decides to get out the genie lift and go up to the ceiling to let down two hanging mics have been coiled up and tucked away in the rafters. He finishes and has done all he can do. Light Designer Alex, works through the script. The light technician continues to work on the re-aiming of a few stray lights, diagnose a problem with one that isn’t working, change some of the color gels that go in the lights. Some things can’t be done with actors underfoot. Other things require the actors to be on stage—checking the sound levels, adjusting the light transitions. Soon enough the actors will be here, unaware that anyone else was here. Their focus now is on getting their lines down, their songs memorized, remembering their dance steps, try things in their costumes. The pit band will arrive too. They will tune and work out a few problem spots and be ready to go. The monitor speaker in the pit was wreaking havoc on the cello it was next to, causing it to come out of tune. The speaker is moved. Tonight will be the first attempt to run the whole show from beginning to end. It will be choppy and people will start to snarl. But there is one week to get it all together, 7 days, 6 rehearsals. During tonight’s rehearsal, the lights will flash and adjust, some actors will have mics, everyone is supposed to be using their props. Actors wait for Melissa and Andy (right) to plan set moves. Everyone now has taken this to a different level of intensity. It is at this point everyone wonders how this will ever gel into a show. Come a week from today, we will find out. 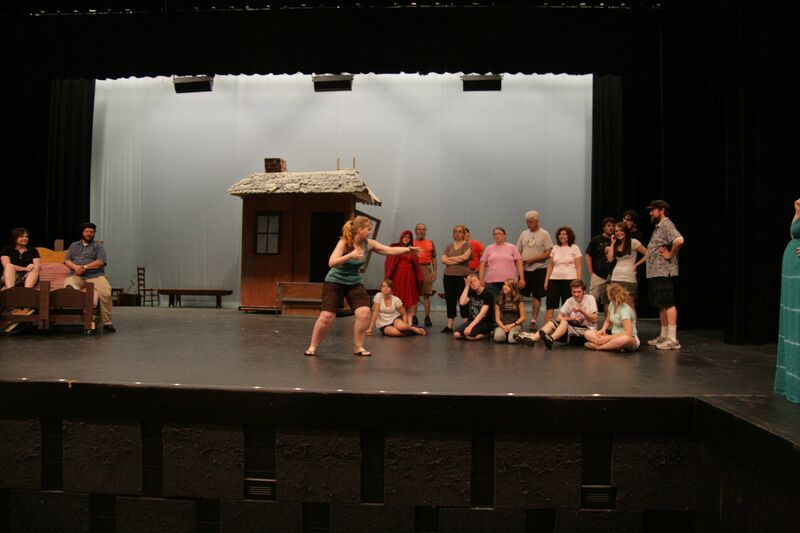 Justine shows the cast the choreography for the Dream Scene. Except for a small contingency that showed up on Saturday morning to work on set pieces, the theatre was quiet during the weekend. Melissa, the Stage Manager, got the floor painted on Sunday since it would have a couple of days to dry. Some of the tech crew started arriving at 5 on Tuesday, testing mics, diagnosing a problem in the light dimmers. And by six the band arrived and took their places in the pit. 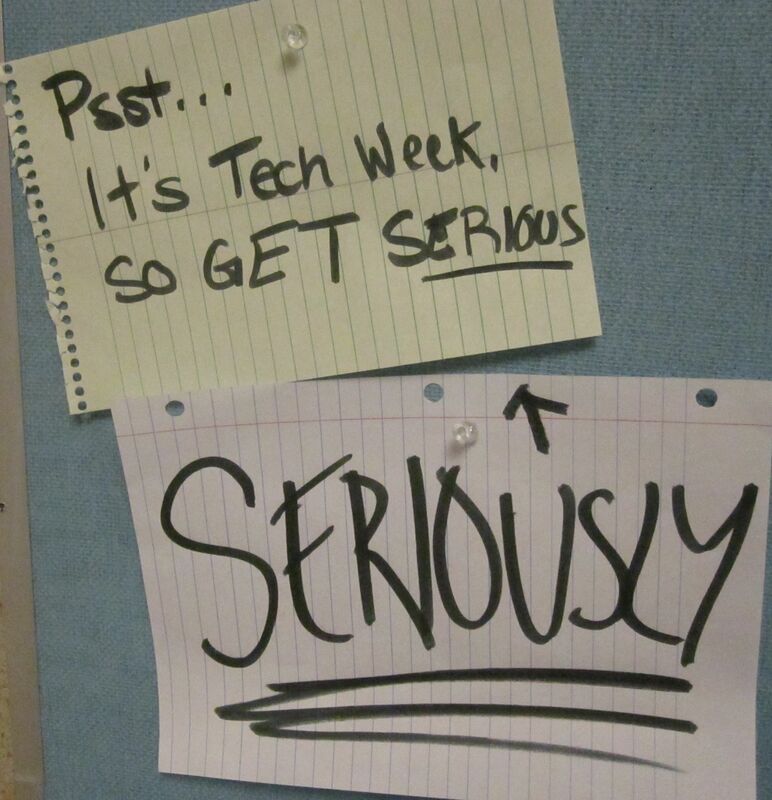 Tech week is here, rehearsal starts at 6 and goes until the Director says stop. It’s the week to work out kinks and bring in all the layers that make live theatre the adventure that it is. The tailor is singing “Miracle of Miracles” on stage left while a sound tech has a lift extended to the ceiling working on a mic on stage right. Melissa, Steve, Andy, and Christa discuss strategy. Before rehearsal, Dave the Producer let everyone know that no one should be sitting when they are not stage, there was too much painting to do. And the actors reacted as the shop was full of painters. This is the touchy painting, adding streaks and details to the set pieces. Their pallets are the lids from five quart ice cream pails with small pools of different color paints, layered on the muslin, cardboard, Styrofoam, and wood to create the highlights, textures and designs. Checking costumes in the green room. There are people in the catwalk adding lights, techs at the sound board determining who needs mics during the performance. And the actors, who have performed with recorded music, finally have the pit band playing. The pace has to be re-honed, the pitch has to be adjusted, the timing of the dance steps fine tuned. Tuesday night ended with an hour working on a scene and Wednesday picked up in the same place and went for another hour as the choreographer kept working with the actors. And finally bits of costumes are starting to show up—hats, aprons, prayer shawls. The time is drawing near and everyone starts to wonder how this will ever come together—8 hours of rehearsal and yet to get through the first act. Tickets are now available for purchase at our friendly ticket outlets: Kopecky’s Piggly Wiggly, Evansville Pharmacy and Bank of Evansville. Please be sure to thank these businesses for supporting performing arts in Evansville. 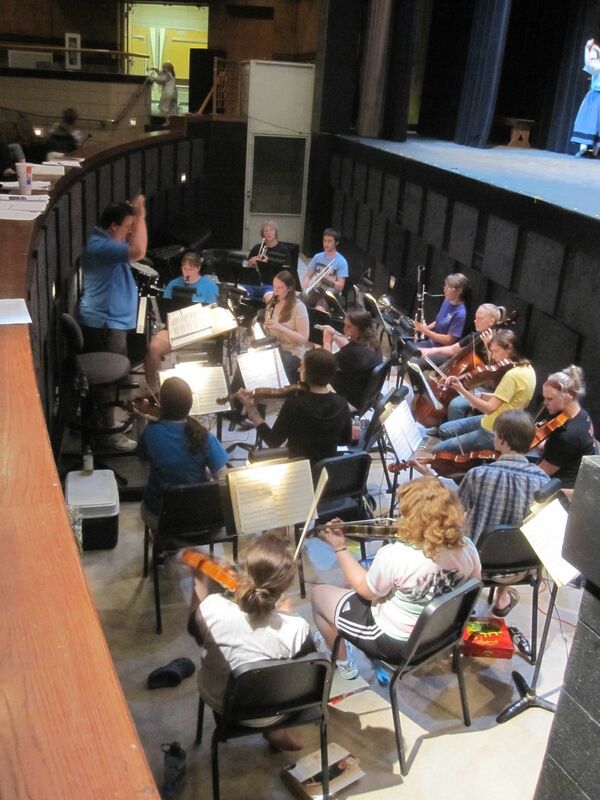 Tickets can also be reserved online and paid for at the Performing Arts Center ticket office at the Evansville High School on the day of the performance. All reserved tickets will be held at the ticket office for pickup at the time of the show. Tickets purchased at our outlets and online reservations are $10.00 each (includes tax). Tickets at the door are $12.00 each (includes tax). You will save two dollars on each ticket by reserving them or purchasing them at one of the outlets. 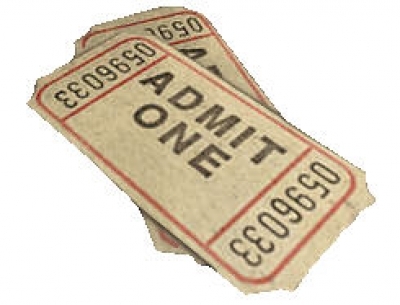 Please click here to go to our ticket reservation page. The ticket office and our ticket outlets will accept cash or check. No credit cards please.